A section of US 52 between Dubuque and Luxemburg, Iowa, was listed in the top 5% of Iowa highways for severe crashes involving impaired drivers and single vehicle run-off-road crashes during 2001–2005, and several crashes have occurred on this roadway near the towns of Luxemburg, Holy Cross, and Rickardsville, Iowa, many on curves. Staff and officials from the Iowa Department of Transportation (Iowa DOT), Iowa State Patrol, Governor’s Traffic Safety Bureau, Federal Highway Administration, Center for Transportation Research and Education Dubuque County, and a retired fire chief met to review crash data and discuss potential safety improvements to U.S. Highway 52. 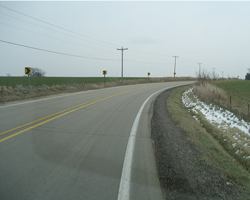 This report outlines the findings and recommendations of the road safety audit team to address the safety concerns on this US 52 corridor and explains several mitigation strategies that the Iowa DOT District 6 Office has selected.